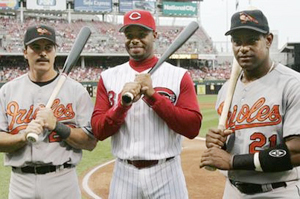 Years before Sammy Sosa (609) un-retired to hit #600 on June 20, 2007, and Ken Griffey Jr. (616+) crashed through the 600 home run barricade with what is perhaps the most graceful swing MLB fans have seen since Ted Williams; these two All-Stars achieved another baseball first by joining with Rafael Palmeiro (569) on June 10, 2005 as the first three members of The 500 Home Run Club® to compete against each other for the first time in big league history. Unfortunately Sosa and Palmeiro teamed up for a rather lackluster day (going a cumulative 1-of-7 with four strike outs) during the interleague contest between the Cincinnati Reds and the Baltimore Orioles. But “The Kid put on quite a show for the hometown crowd at The Great American Ballpark by extending his 13 game hitting streak with a single in the bottom of the sixth. Then, with two out in the bottom of the 8th, he crushed a J. Parrish fastball for his tenth homer of the season. "If I'm compared to Babe Ruth or Willie Mays, that's great. But I'm just going to go out there and be myself. "As long as I have fun playing, the stats will take care of themselves,” Griffey was quoted as saying.